Gamla Uppsala located 60 km north of the modern swedish capital Stockholm was the ancient capital of Sweden. Gamla Uppsala was an important religious, economic and political centre for Sweden and the whole of Scandinavia from around the 3rd century AD. Early written sources claim that already during pre-history times Gamla Uppsala was well known in Northern Europe as the residence of Swedish kings of the legendary Yngling dynasty. The oldest Scandinavian sources, such as Ynglingatal, the Westrogothic law and the Gutasaga talk of the King of the Swedes (Suiones) as the “King at Uppsala”. Astrogeographic position of Gamla Upssala for morphogenetic field level 1 which describes the supraregional, international topics of the town in its role as a swedish capital: one coordinate lies at 1° in self-protective earth sign Virgo the sign of reason, health, medecine, strategical planning, self-cleaning, harvests, storing goods, optimal use of ressources and indicator for spiritual entities of nature and plants. The 2nd coordinate lies on 1° in dynamic male fire sign Aries sign of warfare, action, speed, fighting and an important indicator for Germanic cultures and mentality. Astrogeographic position of the area of the three royal mounds of Gamla Uppsala for morphogenetic field level 3 which describes the atmosphere and energetical topics of the whole sanctuary: one coordinate lies in mystic, spiritual water sign Pisces the sign of the seas, temples, the spiritual plane, dreaming, illusion, legends, fairy tales and the recconnection with the spiritual plane. In regard to the function as a temple site Pisces stands for the aspect of spirituality. In regard to the seat of kings Pisces stands for the religious legitimation and mystification of the kingdom. Compare the combination of the royal palace and national temple of Thailand in Pisces. The 2nd coordinate of the sanctuary lies in highly alert, defensive water sign Scorpio the sign of fortresses and strongholds, hierarchy, visualization, imaging, sculpting and indicator for the construction work done to built the artificial mounds and fortifications. Scorpio also represents the sign of the underworld pointing at the function as grave mounds and/or a place fot reconnection with the spheres of the underworld as in the case of the site of the Saxonian Irminsul (Yggdrasil) sanctuary at Obermarsberg. The Thing at Gamla Uppsala was held together with the great annual market fair called Disting and a religious celebration called Dísablót. The Dísablót was celebrated in honour of the female spirits and deities called the dísir and the Valkyries. The king proclaimed that the leidang would be summoned for warfare during the summer, and all the crews, rowers, commanders and ships were decided. 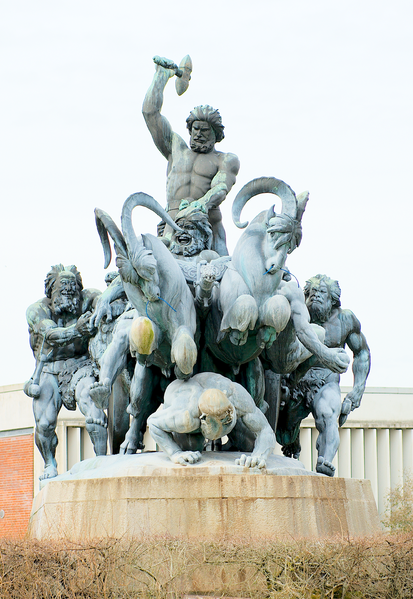 The sacrifice of King Domalde at Gamla Uppsala. 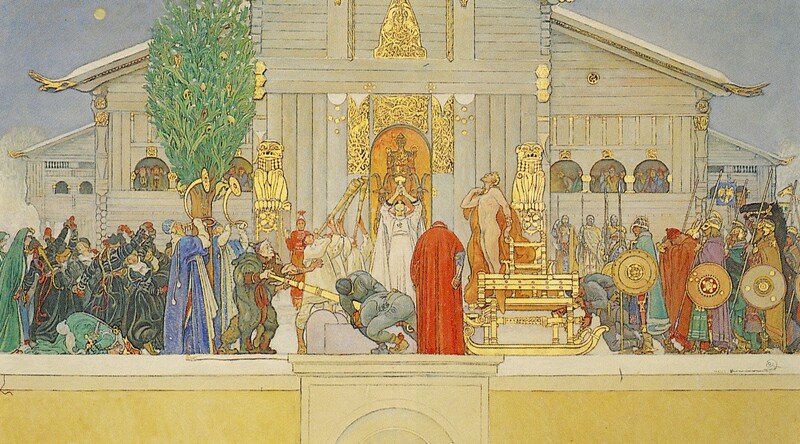 Famous painting known as Midvinterblot (1915) by Carl Larsson. Domalde is protrayed as a willing sacrifice. 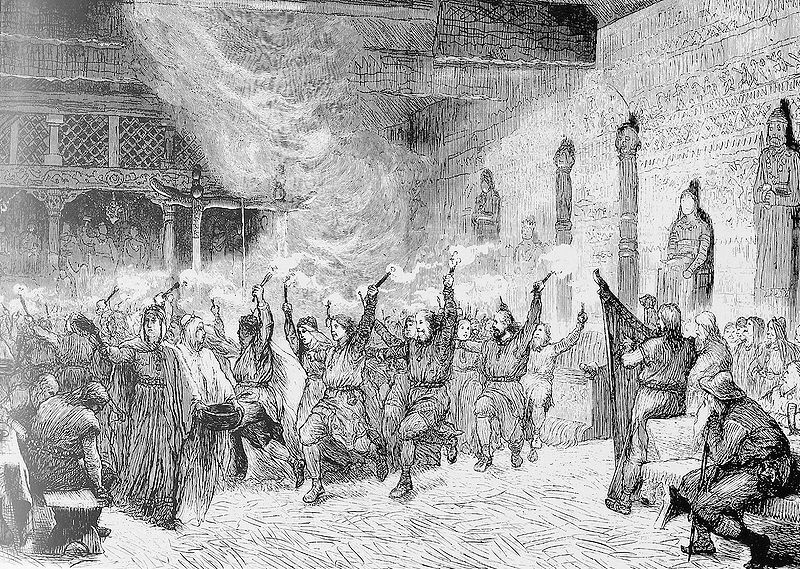 The Temple of Gamla Uppsala was the Norse cultic centre over a long period until the nordic religion was wiped out by the spreading Christianis after around 1000 AD. In 1164 it was made the seat of Sweden’s archbishopric. Gamla Uppsala was also the location of the Thing of all Swedes a general assembly that was held from pre-historic times to the Middle Ages. The date of the Thing was set between the end of February or early March or possibly also around the spring equinox. 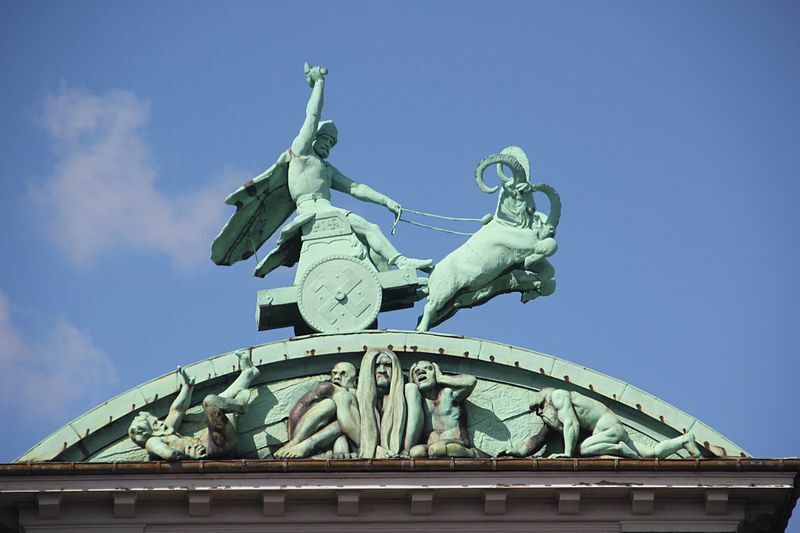 Adam of Bremen described the worship statues of three specific gods that sat on a triple throne inside the temple: Thor, whom Adam refers to as “the mightiest,” on the central throne, with Wodan (Odin) and Fricco (Freyr) seated on the thrones to the sides of him. 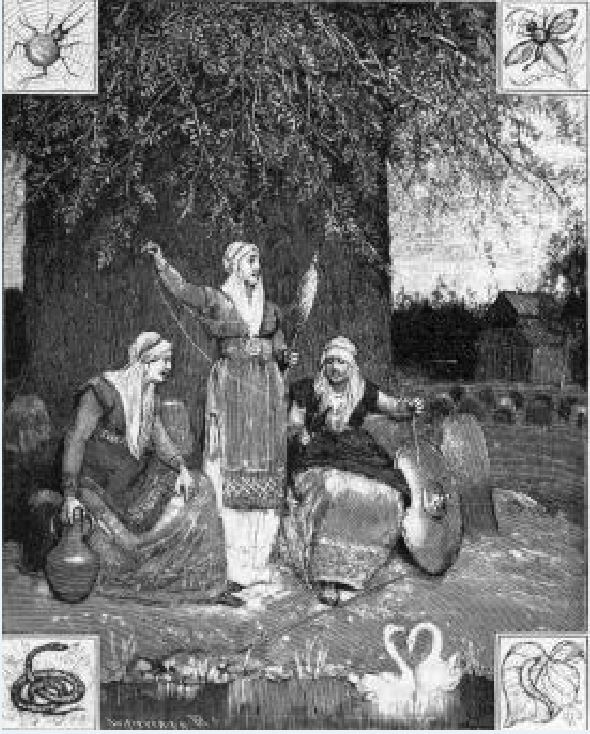 Norns spinning the thread of fate in front of Yggdrasil (the Tree of the Worlds). 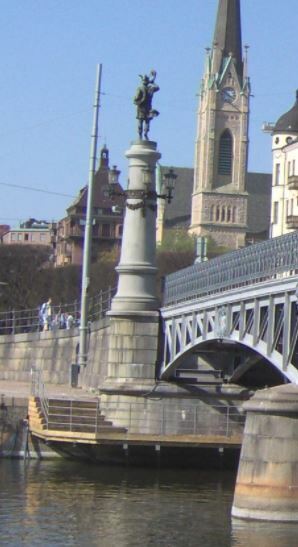 An Yggdrasil statue may have been present at Gamla Uppsala too.